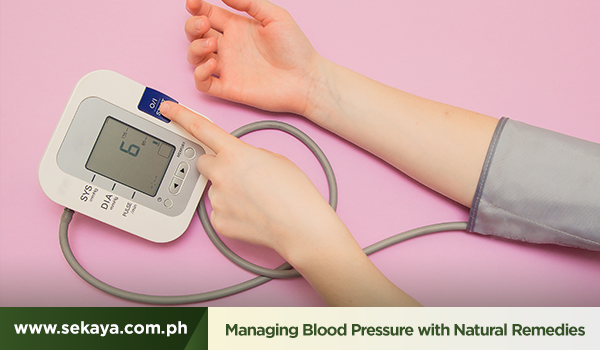 High blood pressure occurs when the blood forcefully moves through delicate tissues and arteries. If left untreated, it may result to multiple fatal conditions including kidney damage, stroke, damaged blood vessels, and heart attack. While timely visits to the doctor is the best way to help monitor your blood pressure, natural remedies that you can do or prepare at home can also be a huge help. Take these healthy suggestions, for example. Exercise doesn’t automatically mean that you have to get a solid gym membership. Exercise can be hiking, swimming, yoga, or anything that gets you moving! Besides decreasing blood pressure and decreasing risks of diabetes and other fatal heart diseases, regular physical activity helps boost your mood, strength, and balance. Getting a healthier and a more active body also means losing a few extra pounds. Also aim for getting rid of your visceral fat. Mostly found in the waist, visceral fat tends to surround various organs in the abdomen which can lead to several health problems. DASH means Dietary Approach to Stop Hypertension and it can help lower blood pressure. Like any diet, it pushes you to make healthy choices when it comes to eating. A DASH diet consists of eating fruits, vegetables, whole grains, low-fat dairy, lean meats, fish and nuts. It also encourages you to eliminate foods that are high in saturated fats like processed foods, full fat dairy, and fatty meats. Desserts and sweetened beverages like sodas and juices are also a no-no. When the body takes in too much sodium (salt), it starts to retain fluid resulting in a spike in blood pressure. The recommended serving of salt per day is 2,300 mg or a little over half a teaspoon. Similar to the DASH diet, it is best to avoid processed food as these are packed with sodium. To add flavor to your meals, use herbs and spices instead. Always choose low-sodium products when possible. While an occasional drink of alcohol is perfectly fine, excessive amounts of it lead to a lot of health issues. Heavy drinking is one of the leading causes of cardiovascular disease. It also affects the efficacy of blood pressure medications. Stress can temporarily increase blood pressure. While it can be difficult to slow down in this fast-paced world with intense demands, remember that there is nothing more important than taking care of your health. Try this: Pause. Take a short moment of your day to recharge and renew. Maybe you can write a highlight experience in your journal, or mindfully prepare a refreshing and nutritious snack or beverage. A delightful punch with high levels of antioxidants and Vitamin C, Citrus Hibiscus can be the perfect everyday cup for eliminating health-damaging free radicals! Did you know that Hibiscus has been found to be helpful in detoxifying and regulating blood pressure? Sample nature’s healing and empowering gifts with Sekaya Botanic Infusions.